Starting tomorrow (May 1st) and running through June 15th StampinUp! is going to be offering 25% off on a bunch of MDS products. The sale will include a selection of downloads as well as print projects. I can't wait to see what they include in the sale- I know I'll be checking first thing in the morning! How about a Gift instead of Cake? The last item we created at the Confetti Cake Occasions class was a gift you could give away for a birthday. Although... it is so cute I'm not sure how many people will part with them. I know mine only went as far as my daughters room (there was the perfect picture of us that just had to go in it!). I found the cute "Tempting Turquoise" frames on sale for $1 each, and then we dressed them up. The ribbon is looped around and just attached to itself using a glue dot. That way it's easy to put a picture in and the flower's location can be adjusted depending on the focal point of the picture inside (and also when I tried to attach it directly to the frame and glass... well let's just say that it didn't go so well). 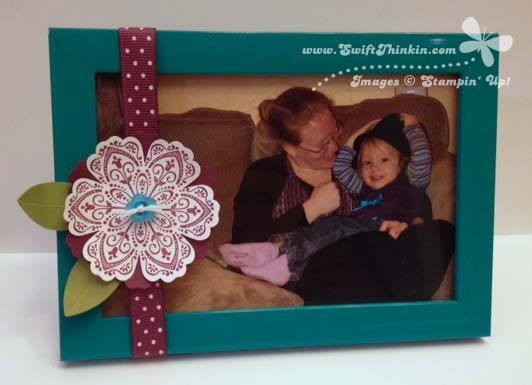 Hope this inspires you to make your own altered picture frame. Flutterback soon! Blossom Petals Punch Hurry this one is retiring soon! Brights Buttons Hurry these are retiring soon too! Yesterday we had our Confetti Cake Occasions class, featuring all things birthday! I don't know about you, but whenever someone has a birthday I'm always left scrambling for a card- so it will be great to know I've got a couple on hand now. The first card we stamped used the new, HUGE Swallowtail butterfly stamp. I just love this stamp (of course, because I love butterflies right?). 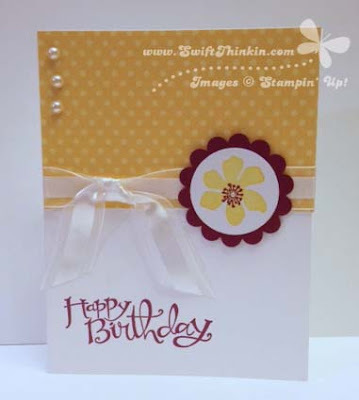 Pair it up with some Summer Smooches DSP and you've got a bright cheery birthday card for this summer. Isn't it grand? It was unanimous agreed that the Swallowtail stamp looked great dressed up in Daffodil Delight, and that the combination would make for great stationary :) Just in case you are looking for a gift idea for someone! Flutter back tomorrow to see the second card from the class. It's that time of year again. Stampin' Up! has released the list of retiring stamps and products. Better stock up before they are gone :) Just click on the links below for easy viewing. It is always sad to say goodbye to some old favorites, but I know it must be done in order to make room for new 'friends' in June. And I have to tell you- I am so excited to introduce you to some of these friends! I've gotten a sneak peek at the new catalog and I am positively drooling :) Hope you are excited to see what is in store for the next year as well! I've got quite the treat for you today! Do you know about the "kissing" technique for stamping? If not it is essentially this: You take a bold image stamp and ink it up in a light color and then you take a patterned stamp and ink it up in a dark color. You then press the two stamps together to transfer some of the patterned ink onto the bold image stamp, which you can then stamp onto your paper. Patsy Waggoner has a great example and video of this technique HERE if you want to see. So where am I going with all this... wait for it... I figured out how to do it DIGITALLY! Yes, that is right. You can now use the kissing technique in MDS (squeal!). 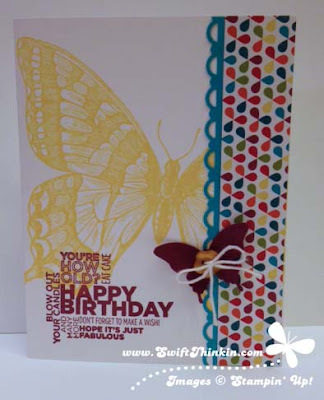 Flutterby again soon for more crafting inspiration! So, why are these files so fantastic? Well, SVG file types are completely scalable- which means you can make them as big as you want without having to worry about pixelation! Isn't that the best news ever! But wait, there's more. Perhaps my favorite trick is that now you can turn a stamp into a punch. WHAT WAS THAT?!? Yes, you heard me right. StampinUp has always used the .svg format for their punches, so now that the stamps are in this format they can also function as punches!! All you have to do is place a copy of the stamp file in your punches folder and ABRACADABRA the magic happens. So now have SVG files completely changed the way you think about designing in MDS? I hope you can think of all sorts of new uses for this fantastic upgrade from StampinUp! Ha. I wish we had April showers... this year all we are getting is SNOW! And you know what April Snow brings? A lot of grumpy Minnesotans :) Hopefully it will still bring flowers too, but that is yet to be seen. In honor of the missing April Showers I wanted this swap card to be the first I shared with you. It was designed by Roxane Waggoner and it is so bright and cheery it makes me want rain! Hope you have a fantastic weekend. Flutterby on Monday for your next MDS video! This past weekend I had so much fun meeting with my fellow Demo sisters. We had a shoebox swap at the end of our meeting, and I came home with a bunch of cute ideas! I can't wait to share some of my favorites with you in the following weeks. I was so happy to find out that printing directly onto a non-white cardstock worked so well! 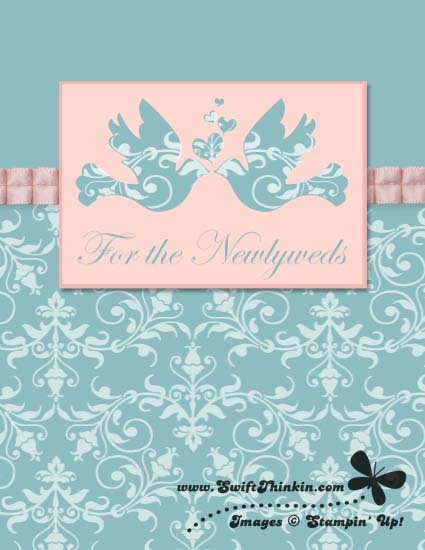 I had actually never tried this before, and just always opted to make my designs for white or vanilla cardstock. But this time I really wanted a colored base... so I gave it a shot and it worked! 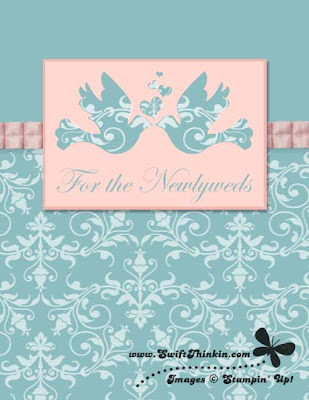 The digital parts of this project include the flowers printed onto the pink base and the punched out label. I love, love, love the fact that we can now color stamps in MDS- that is how I made the "hello my friend" vines and flowers a different color from the text. If you don't know how to color a stamp yet you are missing out! You NEED to learn this cool trick, so check out this video. The rest of the card is all "real" DSP and embellishments (and lots of punches). Want to replicate the look? Check out the recipe card below. And don't forget to flutterby again soon to see some of my favorite swaps! 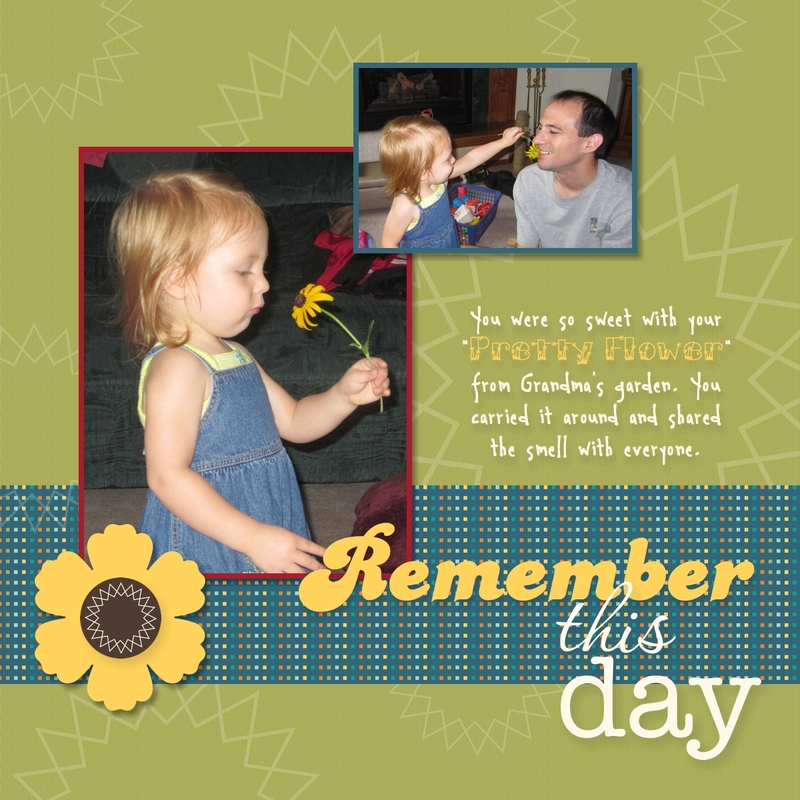 We've already given this page a background and photos, so now lets add some journaling to help capture the moment. Of course I also got presents :) I'm so excited about my new StampinUp Trimmer. If you haven't had a chance see one yet you've got to give it a try. My favorite feature is that the ruler locks down against the unit- so no more flopping around when I transport it. Score! Isn't it just sweet? I've loved this stamp set ever since StampinUp offered it as a sneak peak! I got the digital kit and have made some cute things with it :) If you look really close you'll also see the bling on my 'vase'. It is accented with little pearls- very elegant in person. Make sure you flutterby for a spell on Monday to see the next video in my MDS Basics tutorial, and have a great weekend! Last time we created the green background and stripe of DSP, so let's now find some different ways to add pictures to our page. Here we go! Have I told you yet how much I love the stamp set Serene Silhouettes? It has some gorgeous images in it! They work great as silhouettes, or you can break out the markers and color them in. Two looks for the price of one- WooHoo! So, of course, today's card features this amazing stamp set. 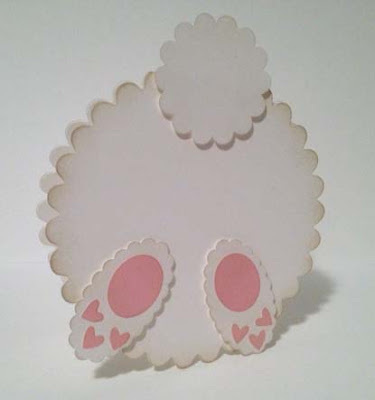 This was one of my mom's designs I copied awhile back. Didn't it turn out nicely?? In order to get the black "ground" look we stamped the tree-tops down next to the ground level and then filled in the rest of the area using black ink and a sponge dauber. Neat trick! To get the look of the sun in the background we used a technique called Reverse Masking. In this case, we punched a circle out of a post-it note (discarding the circle) and then stuck the post-it to the card and sponged orange ink inside the circle window. Another neat trick!! Hope you enjoyed the card and tricks today. Flutterby again soon! Aren't they just adorable! 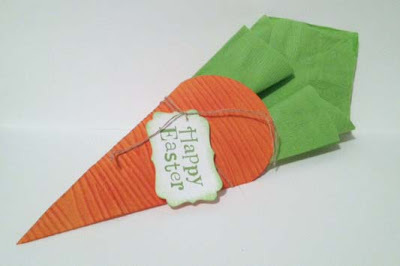 I love how she used the woodgrain folder to give the carrot it's stripy look :) Tip: make the embossed area with an additional layer, otherwise the carrot wasn't very durable. I know that everyone is probably done with Easter already for this year, but I had to share these little gems anyway. That way you can Pin them and be ready with ideas for next year! Or even better, incorporate one or the other into some other spring project you have. After all, by themselves neither carrots or rabbits are specific to Easter :) Check out the supplies used below so that you'll have everything you need when you start. One of the amazing upgrades they put in the new MDS program was the ability to color a stamp multiple colors. In the "real" craft world this would be equivalent to taking a marker to a stamp instead of an ink pad. With the original program this was just not possible to do without a lot of effort and hassle, so I am so thrilled they made it work now! 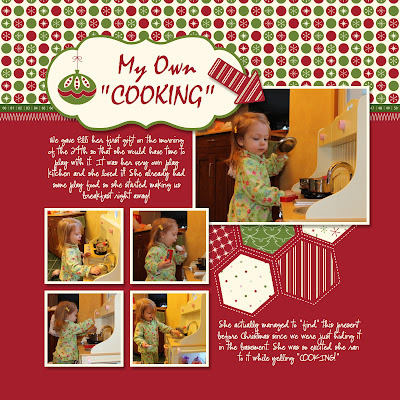 Just check out this page from my Christmas album. See the sweet little ornament in the title? That isn't an embellishment- it is a stamp that I colored just the way I wanted it! To see how it is done just check out this weeks video. Now it's your turn. What stamps will you color in MDS? Flutter back soon!